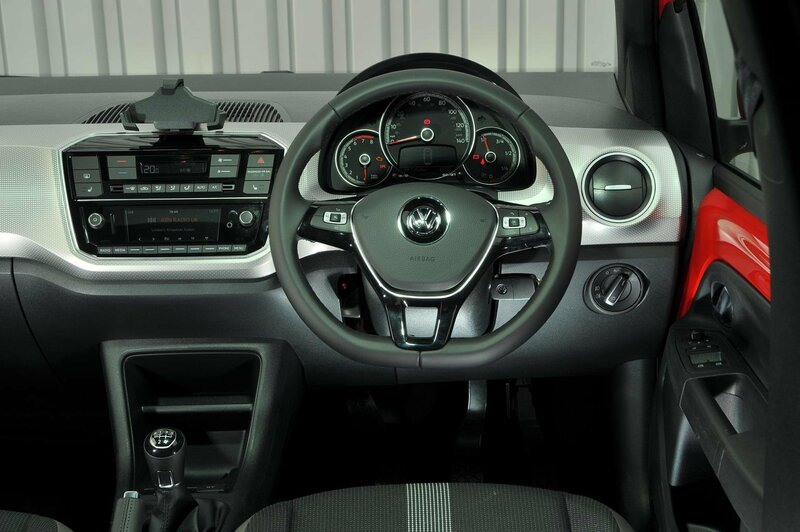 Volkswagen Up Interior, Sat Nav, Dashboard | What Car? Tall drivers benefit from a wide range of seat adjustment, although only mid-range Move Up and higher trims get driver’s seat-height adjustment as standard. Some people might find the seat a little firm and flat, although side support is good, helping to hold you in place through corners. It’s a shame that the Up’s steering wheel doesn’t adjust for reach (it only moves up and down) and, even with the wheel in its highest setting, you might find that it blocks your view of the speedo – that's hardly ideal. However, none of the Up's key rivals offer steering wheel reach adjustment, either. The important controls are sensibly laid out, but one annoyance is that there isn’t a switch for the front passenger window on the driver’s side. You get this handy feature on some rivals, including the Hyundai i10. The view out of the front is excellent, because the Up’s thin pillars barely obstruct your forward view at all and the tall front windows provide a good range of sight. Rear visibility is slightly less impressive, but the Up’s rear pillars are still thinner than an i10's and the rear window isn’t too small. The Up’s relatively square shape also makes judging its extremities pretty easy. Rear parking sensors are an optional extra on all trims apart from entry-level Take Up, as is a reversing camera. The electric e-Up comes with rear parking sensors as standard. Entry-level Take Up trim comes with a decidedly basic CD/DAB radio system with a 3.1in monochrome display, which is controlled using a combination of dials and clearly labelled buttons. There’s no standard Bluetooth connectivity, but a 3.5mm Aux input for playing music is included. A USB socket is a relatively cheap option. A more sophisticated 5.0in colour screen is a reasonably priced option on Take Up models and comes as standard on Move Up trim and above. This system includes Bluetooth and a USB socket as standard. Go for our favourite High Up trim and you'll even get a cradle on the dashboard to hold your phone, along with apps you can download to your phone to give sat-nav instructions or fuel economy training. Love listening to music on the move? The Up Beats is worth considering because this adds – yes, you guessed it – a more powerful Beats stereo. Sound quality is good rather than brilliant, though. 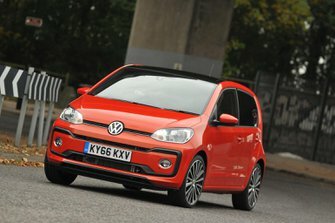 No other city car – not even the Seat Mii and Skoda Citigo with which the Up shares its mechanicals – can quite match the Up for interior quality. Even the lower-end trim levels look and feel surprisingly upmarket inside and very well assembled. The High Up model is even better, with glossy dashboard panels, chrome-rimmed switchgear and plastics that are of a uniformly high standard. 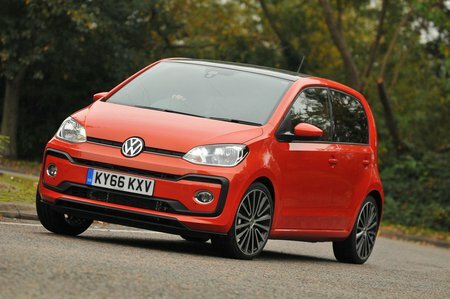 Let's not go overboard, though; you won't find any dense, soft-touch materials such as those in the larger and pricier Volkswagen Polo, but the Up is as classy as city cars get.